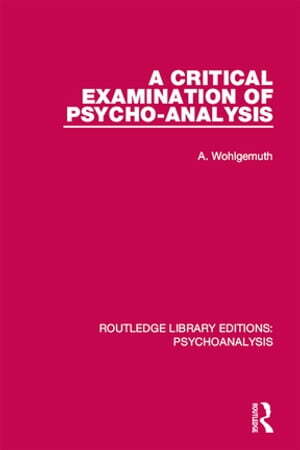 Collins Booksellers - A Critical Examination of Psycho-Analysis by A. Wohlgemuth, 9781317373322. Buy this book online. Originally published in 1923, this title is a critical examination of Freud’s theory of psychoanalysis. A contemporary of Freud, the author sets out to evaluate his theories in a scientific manner, searching for evidence. The result is a rather scathing review of where this is lacking.